View of Homo Fragilis. Installation. © Photo: Kayhan Kaygusuz. Zilberman Gallery is proud to announce Erinç Seymen‘s solo exhibition Homo Fragilis. The artist’s first solo exhibition at Zilberman Gallery is on view from September 13 to November 4, 2017 at the gallery’s main exhibition space in Mısır Apartmanı, Istanbul. The title Homo Fragilis, meaning “fragile man” in Latin, was chosen to investigate the idea of safe symbiosis and promises of prosperity through the essential ties of family and ownership. The exhibition facilitates a debate on the social destiny of a person who has to choose between the sheltered route of coexistence and property accumulation, and the challenges and risks of survival on their own. The transformation of luxury into needs and needs into luxury is like a rampant spirit haunting the show. In Seymen’s works, figures emerging either in veiled / metamorphosed shape or as single limb are the subjects of the two extremes of a social security chart: within the exhibition space redesigned and transformed into a dim corridor by the artist himself, the most privileged (Family Values 1, Three Sisters, Comfort Zone A, Phantom Limb) and the most precarious subjects (The Involuntary, Holy Process, Untitled, The Guest) are put face to face with one another. These encounters create a space for the possibility of reversing one’s social status. Parallel to his previous solo exhibitions, Seymen experimented with painting, drawings, video, sculptures, sound and other media for Homo Fragilis. Here, man-made objects appear to exhibit human behavior and their own will, at times even competing with human willpower (The Volunteer, The Meeting, The Worrying Mansion, Perpetuum Mobile). These objects, which the artist chose to approach with the meticulousness of portraiture, evaluate, worry, and make decisions. Within the exhibition, hetero-patriarchy (Sorcerer’s Wife, Homo Fragilis) and colonialism (Sketches for a Paradise), appear as the two driving forces and collaborators of capitalism. In this function, they permit to address the system of ownership by moving between the familial scale and the societal scale. 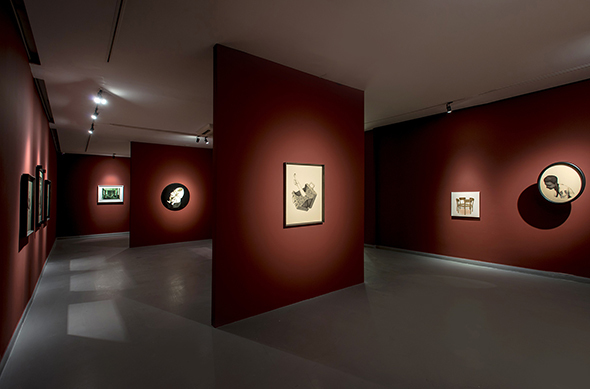 For more information about the exhibition, please contact Serhat Cacekli: serhat [​at​] zilbermangallery.com. Erinç Seymen (1980, Istanbul) graduated from Mimar Sinan University’s Painting Department. In 2006, he received his master’s degree from Yıldız Technical University’s Faculty of Art and Design for his thesis on Bob Flanagan. He participated in various conferences on topics such as militarism, codes of sexual orientation, gender, class identity and nationalism. His writings have been published in magazines such as Siyahi and Kaos GL. Since 2002, he has held solo exhibitions in Istanbul, Ankara, Vienna, Paris, London, Helsinki, Lisbon and Eindhoven and participated in several group exhibitions.